Radionics Box is announcing the immediate availability of the HSCTI JU 1000 orgone generator radionics machine with multiple frequency selections. 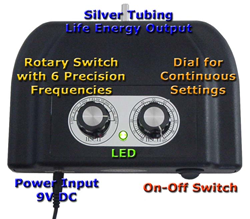 Radionics Box announces availability of the JU 1000 orgonite powered orgone generator for radionics operations. This versatile and powerful orgone generator is available for immediate delivery from RadionicsBox.com. The JU 1000 chi generator radionic device features a user selectable frequency control with settings that include 3.5Hz, 6.3Hz, 7Hz, 7.83Hz, 10Hz, 14Hz, and “right.” When “right” is selected, a second knob is activated allowing a sweeping frequency selector. The JU 1000 has an output power greater than 3 times the entry level JU99CE, however it utilizes the same size output pipe allowing for cross-compatibility with accessories such as the PBT2400 power booster. “The JU 1000 orgone generator is an exceptional value at $369. By providing a versatile frequency control, the JU 1000 has a multitude of uses and can be used for a large variety of radionic operations. When paired with the manifestation series software, such as Super Manifestation Ultimate 2.0 or Manifestation Pro, the JU 1000 becomes a serious radionics workstation for beginners and professionals alike,” says Mike DeVino, radionics master and radionic device expert. The JU 1000 radionics machine and orgone generator with orgonite core is available from RadionicsBox.com for $369 with free shipping to the USA. For more information about radionics, orgone generators and the JU 1000, visit their website at radionicsbox.com.